Bespoke kitchen tea towel with Fruit of the Spirit is Kindness embroidery and cherries motif on a pale pink cotton drying towel. 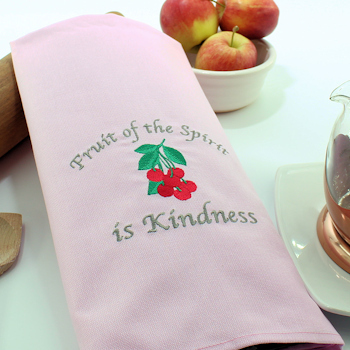 Bespoke kitchen tea towel with Fruit of the Spirit is Kindness embroidery and cherries motif on a pale pink cotton drying towel. Unique gift idea for a new home, wedding anniversary, birthday, Mothers Day or Fathers Day. Pale pink cotton tea towel approx 45 x 68cm. Bespoke kitchen tea towel with Fruit of the Spirit is Kindness embroidery and cherries motif on a pale pink cotton drying towel. Unique gift idea for a new home, wedding anniversary, birthday, Mothers Day or Fathers Day. Pale pink cotton tea towel approx 45 x 68cm. Custom design embroidered to the bottom centre so this can be decoratively folded over a oven rail. Great gift and does the drying up too!